Here's a somewhat hard-to-find late-'50s Coca-Cola "fishtail logo" 12 diameter glass-front wall thermometer made by the Pam Clock Corporation. It's very likely New Old Stock (unused). Mint condition on the front with bright color and no flaws in the paint no rust specks, no blisters, no flaking, etc. Clean on the inside of the glass and there's no debris trapped inside. No dents in the aluminum housing. 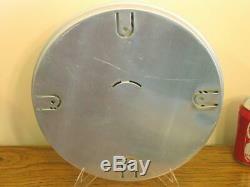 Only minor scratches on the back, and the four bend-out mounting tabs never having been bent.
" instead of "Trade Mark (R) making it right for the mid-'50s -- some claim the fishtail logo dates from around 1958. This might not be the most attractive thermometer issued by Coke but the condition of this example would be hard to beat. 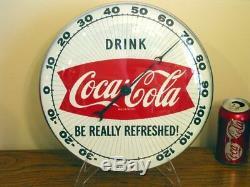 The item "MINTY Coca-Cola PAM Fishtail 12 Round Wall Thermometer Sign" is in sale since Saturday, March 23, 2019. 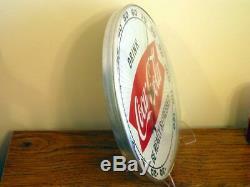 This item is in the category "Collectibles\Advertising\Soda\Coca-Cola\Thermometers". 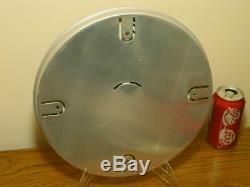 The seller is "toysaurus" and is located in Lisle, Illinois. This item can be shipped to United States.